Commonwealth War Cabinet-in-exile: (r. to l. ) Defense Secretary Gen. Basilio J. Valdes, Resident Commissioner Joaquin Elizalde, President Manuel L. Quezon, Vice President Sergio Osmeña, Finance Secretary Andres Soriano, Auditor-General Jaime Hernandez. Washington, D.C, May, 1942. Watch: British Pathe newsreel: Treasure Submarine, 1942. At 10 p.m. I was already in bed when the phone rang. It was the Chief Justice telling me to get dressed as we had to go to the vault, to perform a secret and delicate mission. I dressed hurriedly met them at the entrance of the Malinta tunnel and we proceeded by car for the vault. The guards were surprised at our unannounced visit. A few minutes after we arrived, Commander Parker U.S. Navy and some men with two station wagons arrived followed closely to the Staff of the U.S. High Commissioner. We worked incessantly all night. The work was performed with military proficiency, no noise, no conversations. We finished our mission at 4:30 a.m. What a relief! I returned home very tired and exhausted. 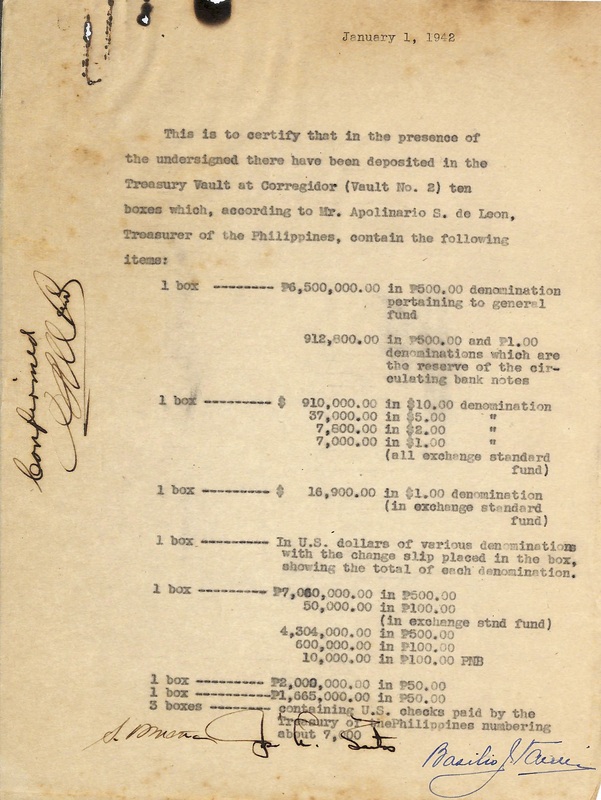 This was the transfer of the gold reserves of the Philippine Government from vaults in Corregidor to a U.S. submarine, which brought the reserves to the United States. Dear Manolo, I’ll go direct to the point. Please help me unravel a mystery that has not only aroused my curiosity but baffled me as well. With your considerable reputation as a historical sleuth, I’m confident you can solve or otherwise clear this up. Whatever will be the outcome will make for a good thriller. Of that I’m sure. The mystery concerns what I call our national treasure consisting of some 20 tons of gold bars. This represents our country’s entire gold reserve at the time and quite possibly the total output of all the gold mines operating in the Philippines. The fabled Yamashita treasure, which in all likelihood is just a figment of the imagination, seems like loose change compared to the enormous value of this real-life treasure which may exceed 20 billion U.S. dollars using the current price of gold per kilo. 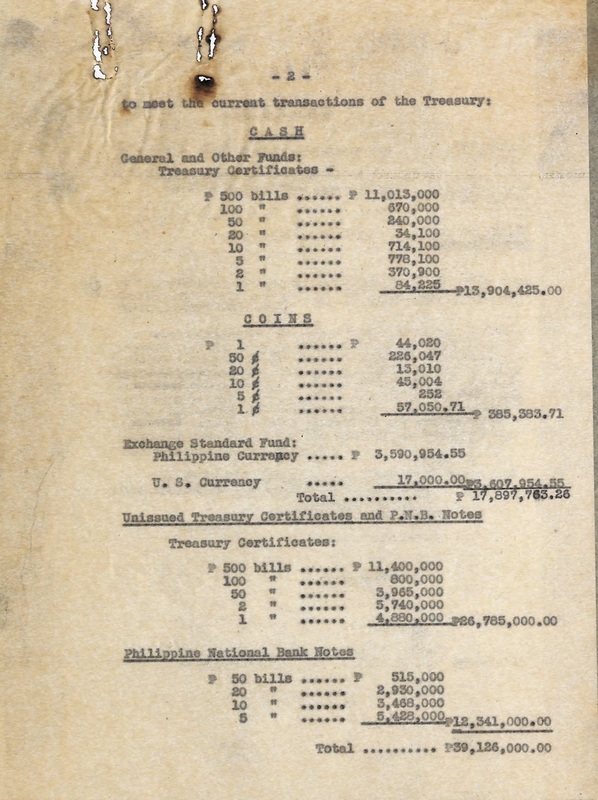 When Bataan, Corrigedor, Manila and the rest of the Philippines were about to fall to the Japanese in 1942, all the gold bars were removed from the Central bank located then at the port area in Manila and ferried by a navy vessel to Corrigedor. The precious cargo was loaded onboard the U.S. submarine U.S.S. Trout. On February 22, 1942, it left Corrigedor for Guam. Also aboard were President Manuel L. Quezon, his family and a few, select members of his wartime cabinet. President Quezon and his party, however, landed at Cagayan de Oro and then motored to the highlands of Bukidnon where they were flown to Australia. From there, they went to America where President Quezon lived in exile until his death at Lake Saranac in New York in 1944. So much has been written about the harrowing and exciting escapes of Pres. Quezon and General Douglas MacArthur from the “Rock” fortress, the latter by PT boat. Both were highly-secret naval operations to save the two from eventual capture by the enemy. But little, if none at all, is known about the enormous cargo of gold which President Quezon obviously brought with him. It seems this was the bigger secret, and it is not far-fetched to think that the Japanese were also after it. The gold bars reached Guam and were transferred to the heavy Cruiser USS Michigan which sailed on to San Francisco where they were finally off-loaded at the wharf there. This is where my story ends, and the mystery begins. Where did the shipment go from San Francisco? Were the 20 tons of gold all brought to Fort Knox where gold bullions such as these are generally known to be stored for safe-keeping or somewhere else in the United States? Assuming that they were indeed kept at Fort Knox, what happened to them after the war? Were they ever returned to the Philippines? If so, when and by what means? There should be a paper trail in this secret odyssey of our national treasure. The Central Bank should or ought to know the whole story. The time has come to tell this in its entirety. Whether by design or plain oversight, we’ve been kept in the dark for close to 63 years. History abhors a mystery. So do I and, of course, you. I will be vastly relieved if this story has a happy ending; that our national treasure is intact afterall and has not been lost or stolen. Kindly take over where I left off at the wharf in San Francisco and finish the whole drama to its conclusive ending whatever that may be: either good or one more national disgrace. Thank you for your letter. 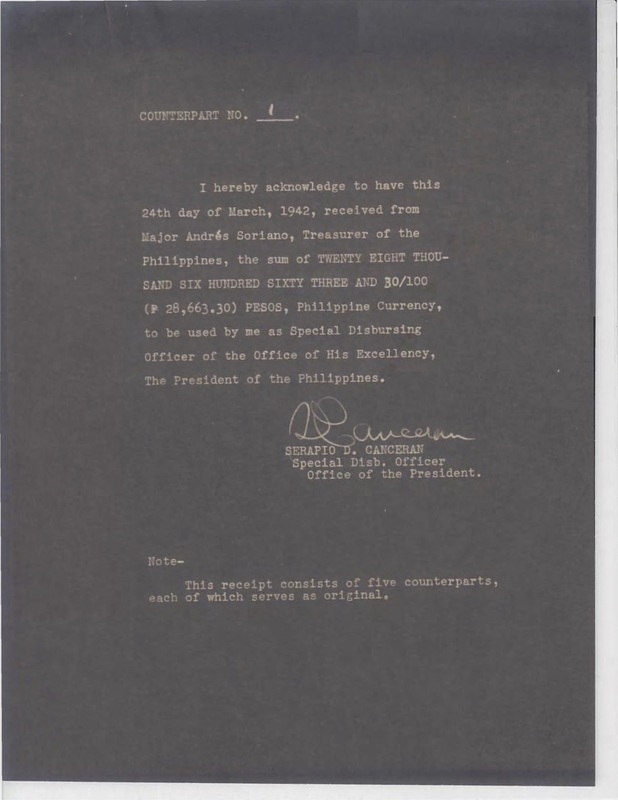 The disposition of the Philippine Treasury (its transfer from Manila to Corregidor, and the transfer of a large portion of it to the United States) was accomplished by a committee presided over by Chief Justice Jose Abad Santos (in his capacity as Secretary of Justice and Finance in the War Cabinet) and included Manuel Roxas. Treasury certificates and paper currency were burned after being itemized and notarized in a list. Coinage was dumped in the sea (where some of it was salvaged by the japanese, the majority of the coinage, however, being salvaged by the US Navy after the war). President Quezon did not leave on the same submarine on which the Philippine bullion reserves was transported. The submarine you mentioned, the USS Trout, was not the submarine he traveled on, the USS Swordfish. Neither did Philippine officials leave on the same date as the shipment of Philippine gold reserves to the USA. 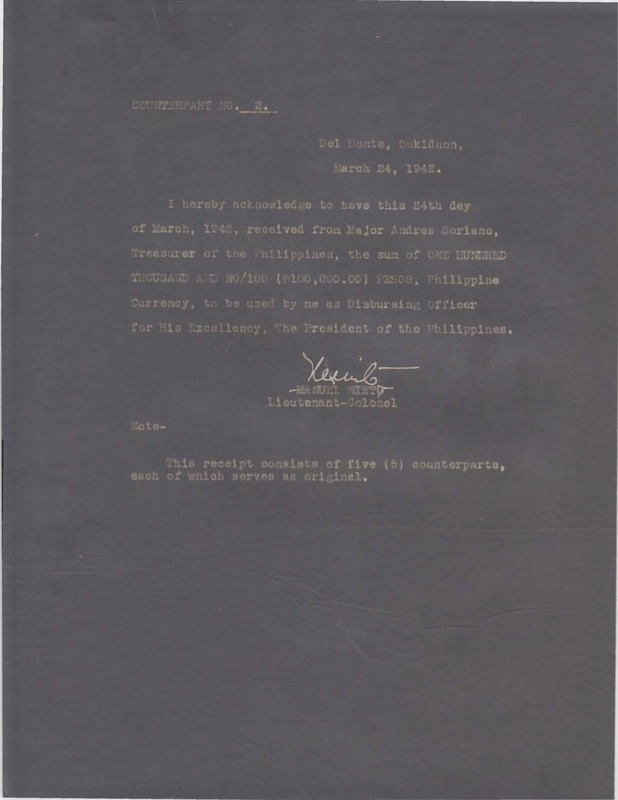 Part of Abad Santos’s work on Corregidor as secretary of finance was the custody and disbursement of government funds. With [Vice President] Sergio Osmena, [Philippine Army Chief of Staff] Basilio Valdes, Jr., [Colonel] Manuel Nieto, and members of the American High Commissioner’s staff, he checked the gold bullions and silver coins deposited in Corregidor. He supervised the shipment of these by submarine to the United States. He superintended the burning of about forty million pesos in paper bills. Another of our asiatic submarines had a unique assignment. 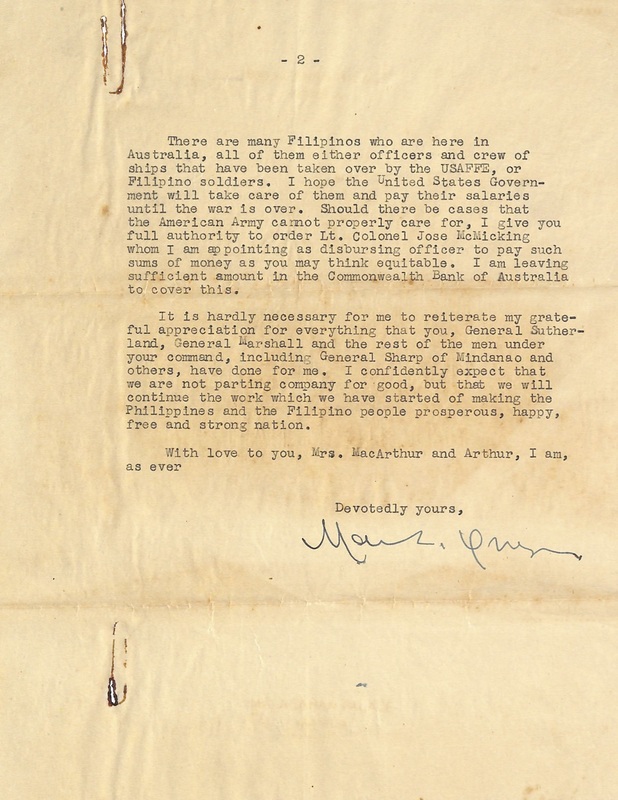 Lieutenant Commander Frank W. “Mike” Fenno was given the job of evacuating the precious metal belonging to the Treasury of the Philippines and the banks from the Islands before the Japanese got their hands on it. This tall, sloping shouldered ex-captain of a champion Naval Academy baseball team –and who pitched our Asiatic Submarine baseball team to a Fleet victory when I was out there in the s-40– had been currently bringing in ammunition for the anti-aircraft guns on Corregidor. The shells were also worth their weight in gold. The Japanese knew of course that there was a large amount of gold stored on Corregidor and in the bank vaults of Manila. Needless to say they were most desirous to obtain it. 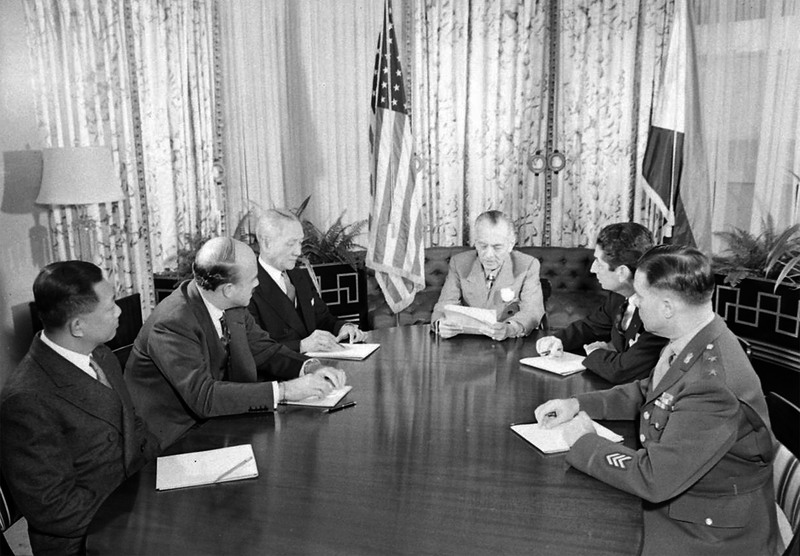 Efforts to prevent the Japanese from getting the gold were under way immediately after the war begun. American and Filipino stevedores worked day and night collecting metals, currency and securities belonging to the Philippine Commonwealth, to banks and mines and individuals. On the night of February 4th, Captain Ferino brought his submarine into the harbor on the south hook of Corregidor, unloaded his precious cargo of much-needed anti-aircraft ammunition and took on gold and silver. Before the morning’s early light could expose the submarine to the eyes of Japanese patrolling planes it had slid out of the harbor and remained submerged during the day. After nightfall it was again alongside the dock and ton after ton of gold and silver was loaded aboard. This task was completed about 4 a.m. -too late to carry out the next assignment. The next night the submarine kept a rendesvous with an auxiliary vessel carrying the securities that were to be evacuated. 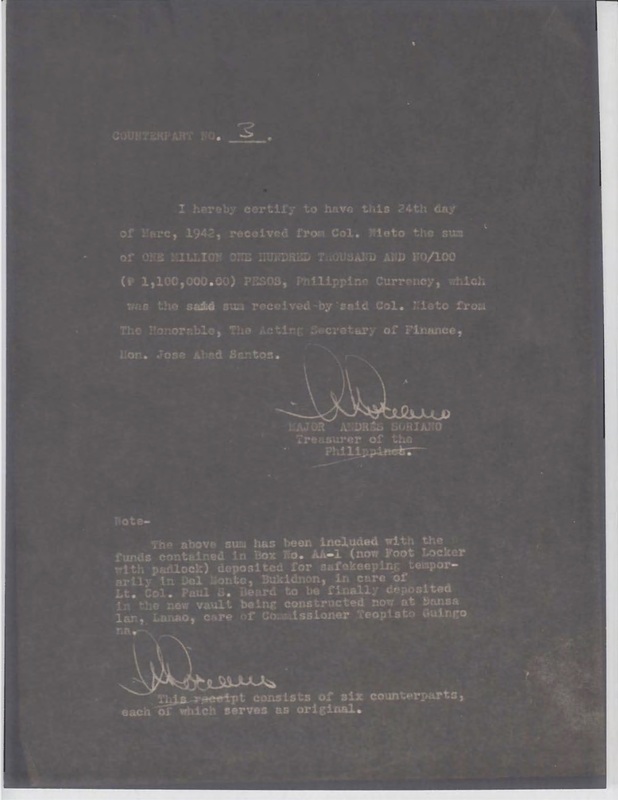 Mr. Woodbury Willoughby, former financial adviser to Mr. Francis B. Sayre, Philippine [High] Commissioner, to whom the Navy gave much credit for collecting the wealth of the Philippines, was on the auxiliary vessel and described the submarine’s appearance in the dark. ‘When nightfall came,’ related Mr. Willoughby, ‘the auxiliary vessel sailed from Corregidor to the rendezvous with her load of securities. The submarine did not make her appearance immediately. But, after a while, the dark hulk of the submarine pushed through the surface. ‘It took about 20 minutes to transfer the securities. Then Commander Fenno made a remark I’ll never forget. His crew had gone below and he was standing by the conning tower preparatory to giving the order to submerge. ‘Any passengers?’ hr asked cheerfully. Any of us would have been glad to get aboard that submarine but it was not for us to leave. 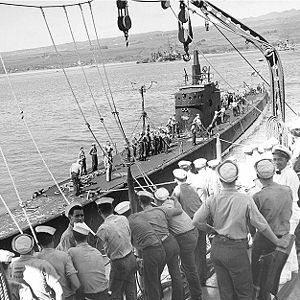 We had to tell him no.’ During the long trip from Manila to Pearl Harbor several Japanese ships came within range of the American submarine and Captain Fenno lost no time in sending them to the bottom. The mere presence of tons of gold aboard could not keep my good friend ‘Mike’ out of a fight. On March 20 Commander Fenno was awared the Distinguished [Navy] Cross for his entire crew of six officers and sixty-four men received Silver Stars for the feat of spiriting out a vast treasure of gold and silver from Corregidor right under the nose of the Japanese forces, and then sinking three of their ships. “In addition to the valuables taken to Corregidor by the Office of the High Commissioner, a large amount of gold, silver, and paper currency was held there by the Commonwealth Government and was never turned over to the Office of the High Commissioner for safekeeping. 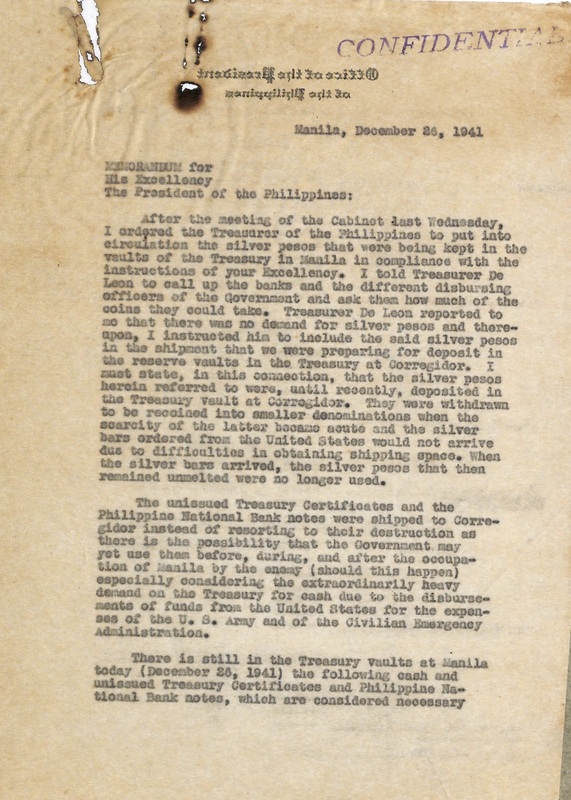 Ther gold and sliver, which served as currency reserves, were on Corregidor, in the Philippine Treasury Reservations on that Island, before the war started. The gold comrpised 269 bars with an indicated weight of 1,343,493.95 grams and was derived from the melting of $805,410 face value of United States gold coins held by the Commonwealth Government at the time of the devaluation of the dollar in 1933. The silver was in the form of 1-peso coins an aggregate face value of P16,422.000. There were several small pieces of gold and silver in addition to the above. 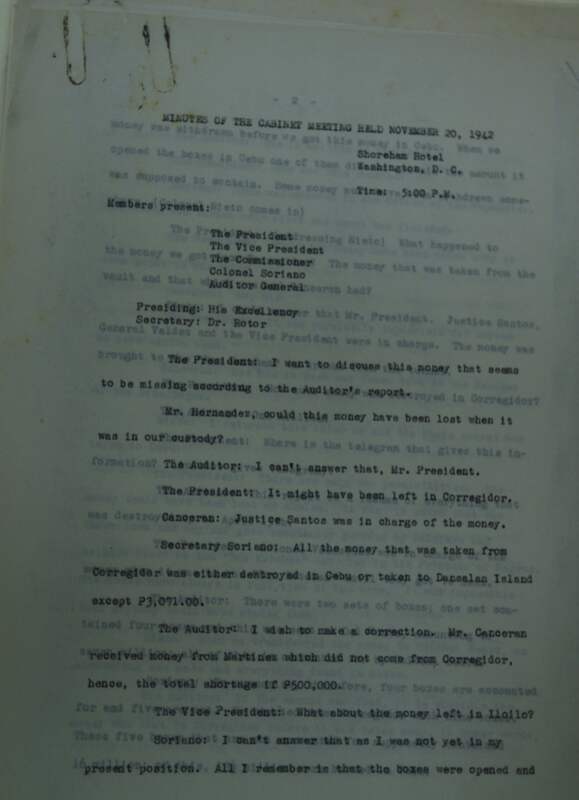 All of the gold and a large amount of 1-peso coins were loaded under the supervision of Commonwealth officials, headed by Vice President Osmena, and were sent to the United States as ballast on the same submarine which carried the gold held by the High Commissioner. 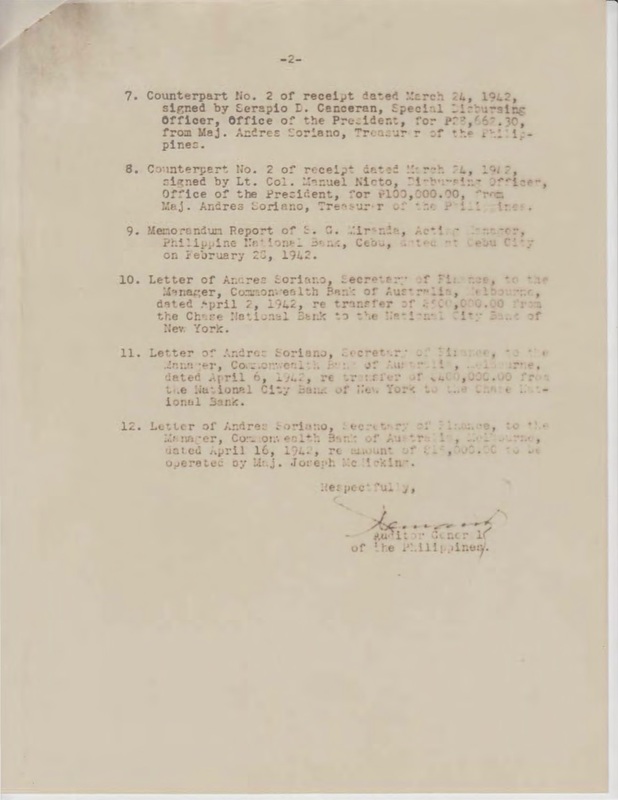 “It Is believed that the Philippine paper money in the Treasury reservation was brought to Corregidor by the Commonwealth officials who accompanied President Quezon when he was evacuated from Manila. 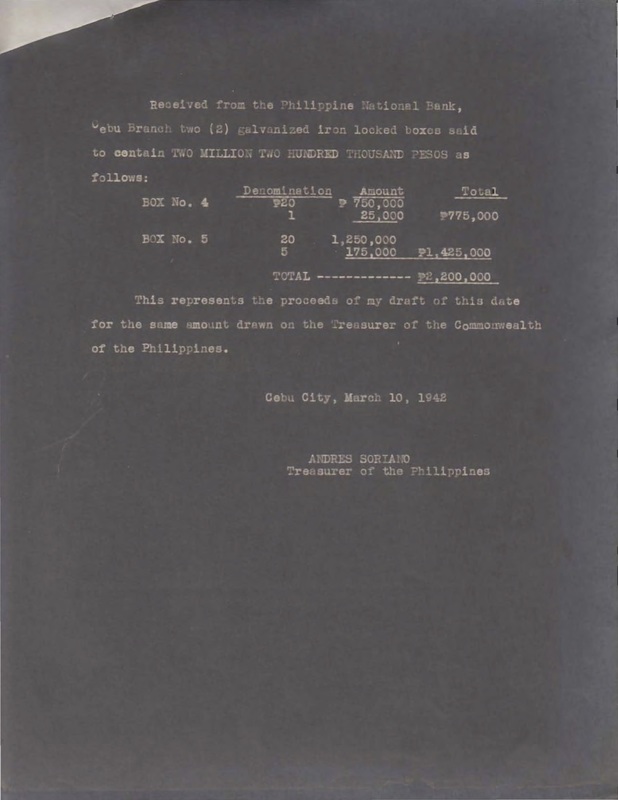 It appears from the records supplied by the Commowealth government that there was, early in Jaunary 1942, P78,261,825 in Philippine paper currency of various denominations held by the Commonwealth in its vaults on the Treasury reservation. This was subsequently increased by P19,900,000 clearing house funds, as noted above, making a total of P98,161,825. 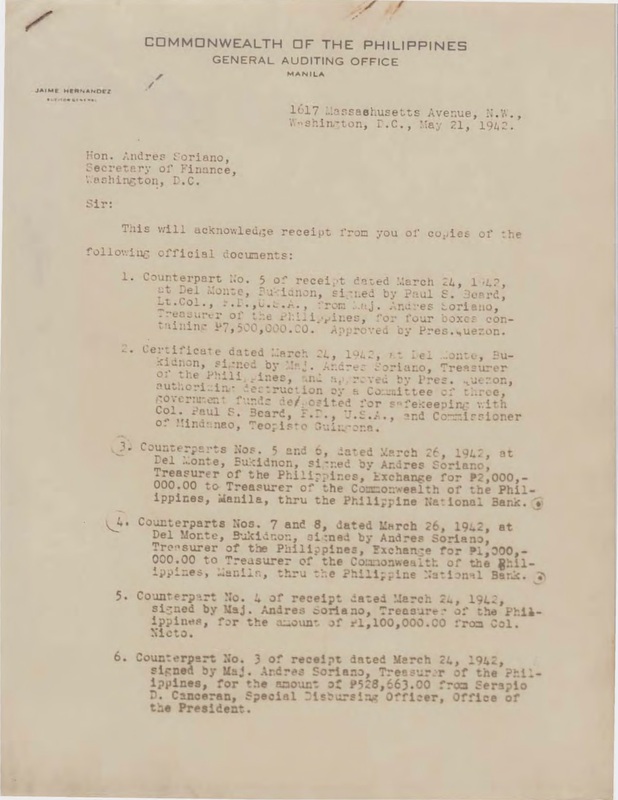 As for the disposition of government funds from 1942-45, the relevant executive issuances are in Executive Orders of the Commonwealth of the Philippines, Manila, Bureau of Printing 1945 I hope this answers your inquiry to your satisfaction. There was no mystery surrounding the transfer of treasury funds as they were the currency reserves of the country. It was against the value of this gold that emergency wartime currency was issued by the guerrillas. Thank you likewise for your very kind, comprehensive and scholarly reply to my query. I’m completely satisfied that we have a happy ending here. Obviously, those were the times (perhaps just a golden memory) when public servants can be trusted with million of pesos of the people’s money. You’re absolutely right. President Quezon and party did not leave onboard the submarine USS Trout but the USS Swordfish. I assumed that he did so because the date of his departure was Feb. 22, 1942, about the same as the ETD of USS Trout. ThatÃ’s what I got for dealing with scanty and segmented data. Sorry. There’s no mystery about the great wartime of our national treasure NOW. That’s because you’ve cleared that. How many students of history know what you’ve just narrated? I’m not sure if this event was discussed at all in our history classes with the length and clarity you just did which has amply justified my description of you as a historical sleuth. And what about the technical documents and process by which the gold reserve and other funds were removed from the Central Bank and our country. That certainly is something we didn’t know before. Now we know better. Thanks to you. The lesson here seems to be: We should study our history more thoroughly and seriously. We can’t simply rely on you and a few other scholars to do so for us. Your narrative was gripping, accurate and thrilling – and worth the reading. I said that earlier. I’m not disappointed that the whole episode had a happy ending. And I’m relieved. As was I, as I didn’t know the answer in full until Atty. Almeda made me look into it! 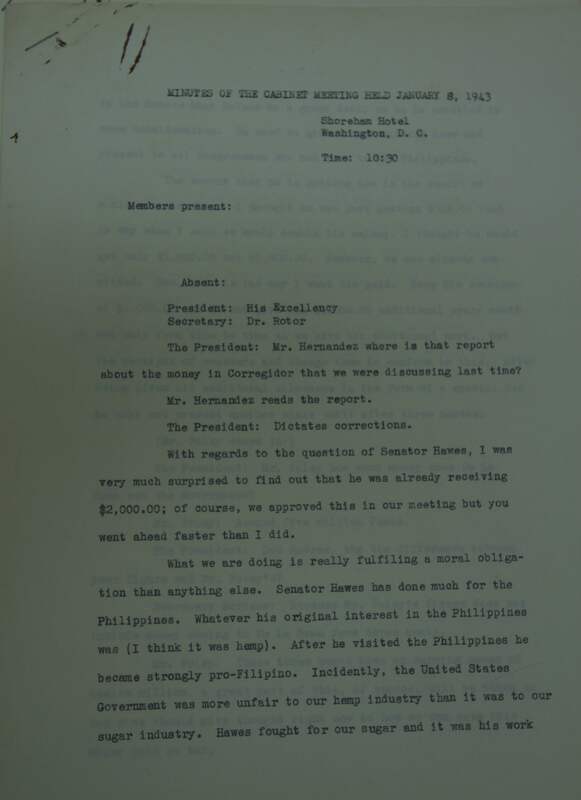 On a final note, the compensation given to the Philippines due to the devaluation of the US dollar, which Romero mentioned in the first extract in this entry, was officially quantified in the High Commissioner’s report quoted in turn, above. 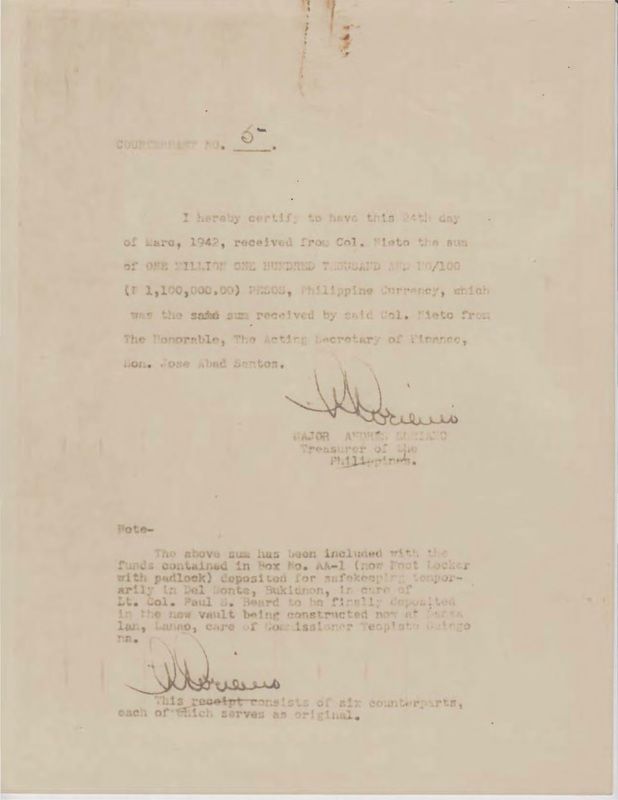 Additional documents I’ve encountered, concerning the disposition of currency notes, can be gleaned from the papers of President Quezon and of Andres Soriano, Acting Treasurer of the Philippines and then Secretary of Finance in the War Cabinet. They trace the story of the disposition of treasury funds during the hectic opening months of the war. Preventing Philippine government assets from falling into the hands of the Japanese. Authorizing the continued expenses of the government in areas free from enemy control. This was done by virtue of the Emergency Powers granted the president. 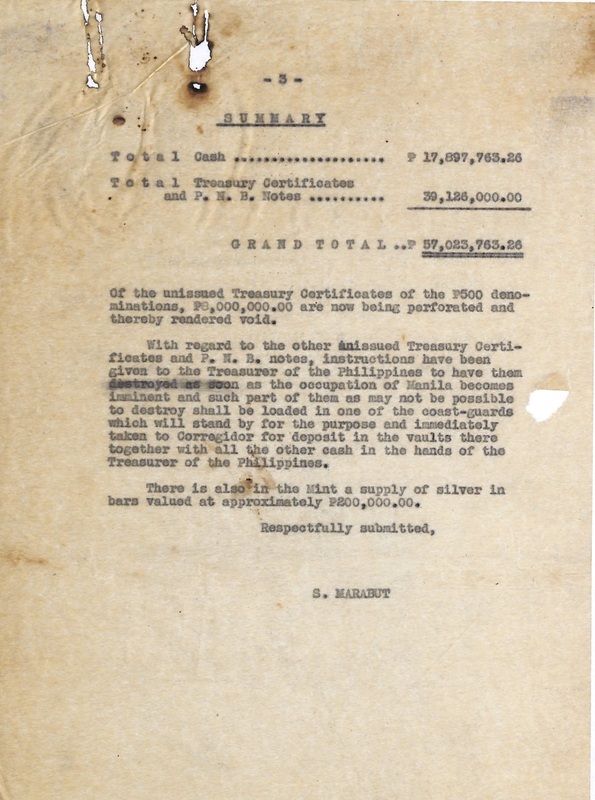 December 26, 1942: Memorandum from National Treasurer Serafin Marabut on currency notes and certificates, and inventory for purposes of destruction to prevent capture by the enemy. Part 1, part 2, part 3. 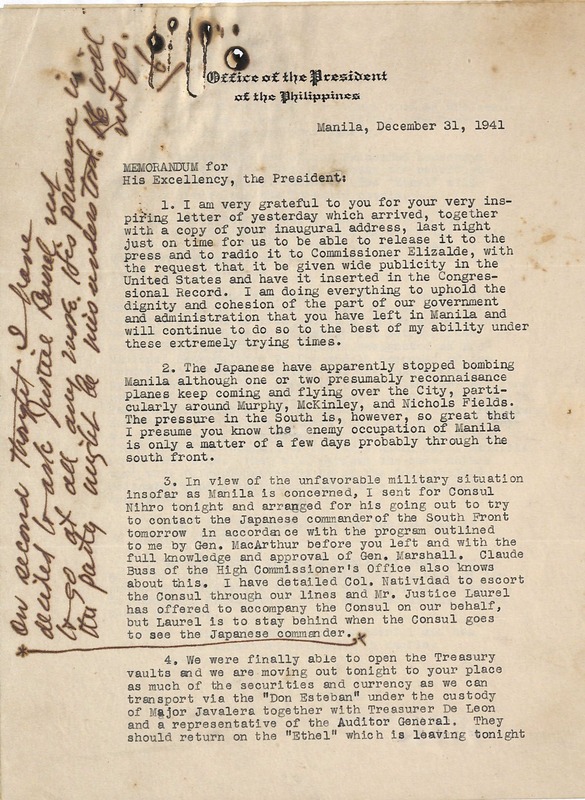 December 31, 1941: Jorge B. Vargas writes from Manila about moving as much as possible from Manila to Corregidor before the arrival of the Japanese: part 1, part 2. 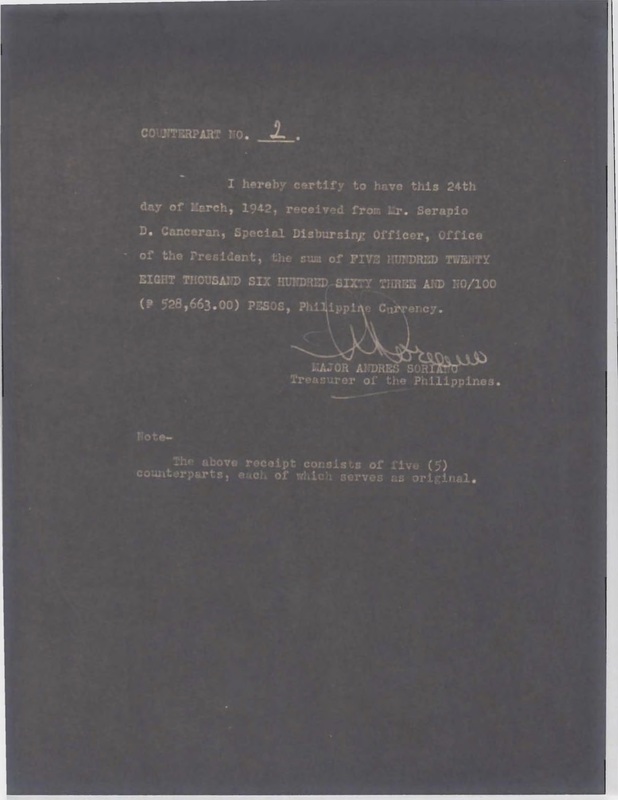 Undated, but likely December 31, 1942: Designating Vice-President Osmeña to hold keys to Treasury Vault in Corregidor. 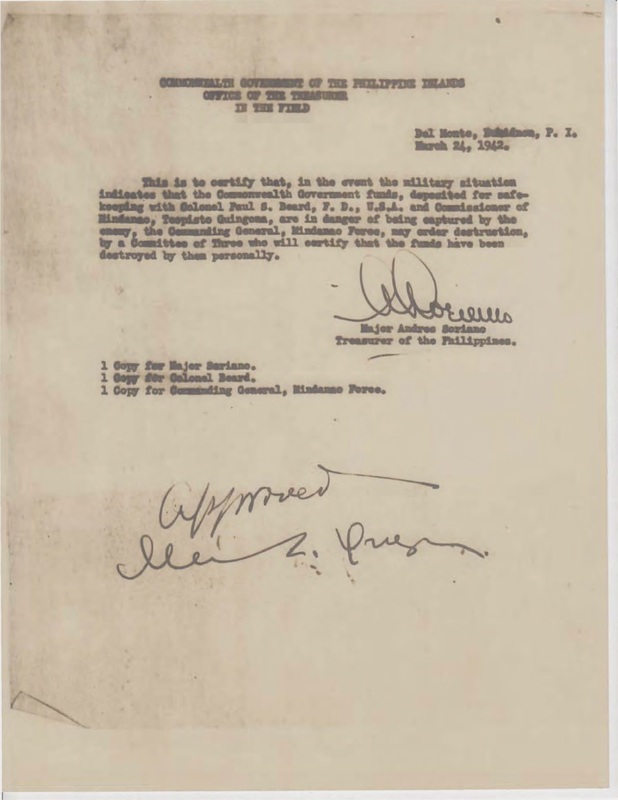 January 1, 1942: Certification signed by Vice President Sergio Osmeña, Chief Justice Jose Abad Santos, Gen. Basilio J. Valdes, of currency and coinage from Manila and received in Corregidor. 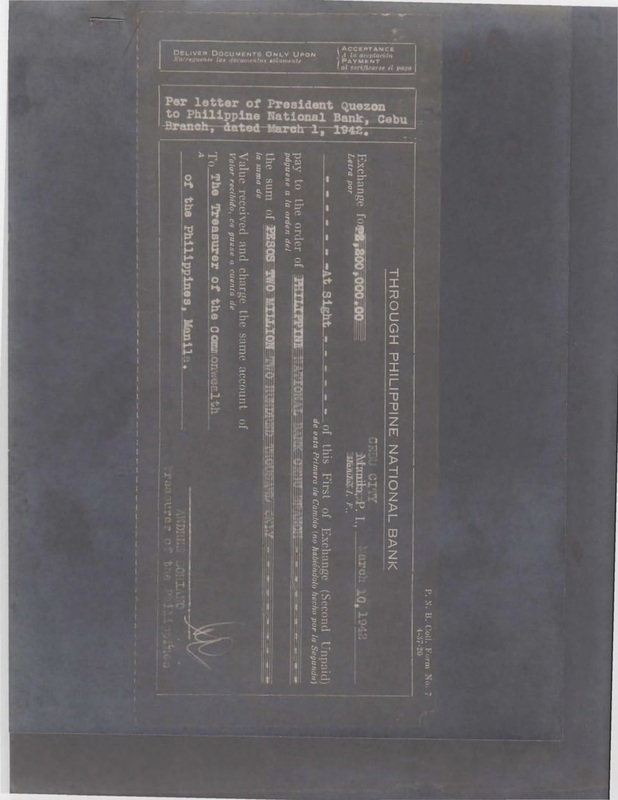 February 4, 1942: Transmittal receipt of government gold reserves transferred to safekeeping of submarine commander. 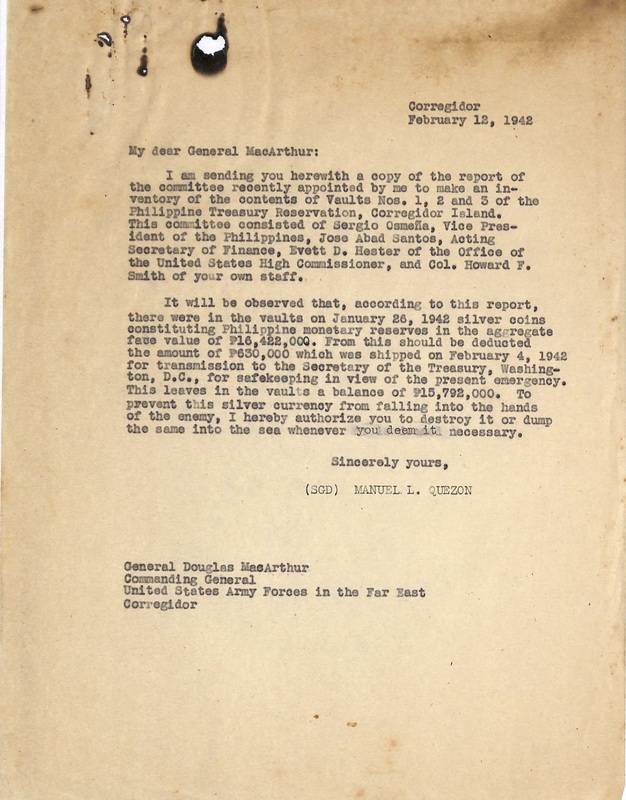 February 12, 1942: Memorandum to Gen. MacArthur arranging for inventory of contents of Treasury Vault. 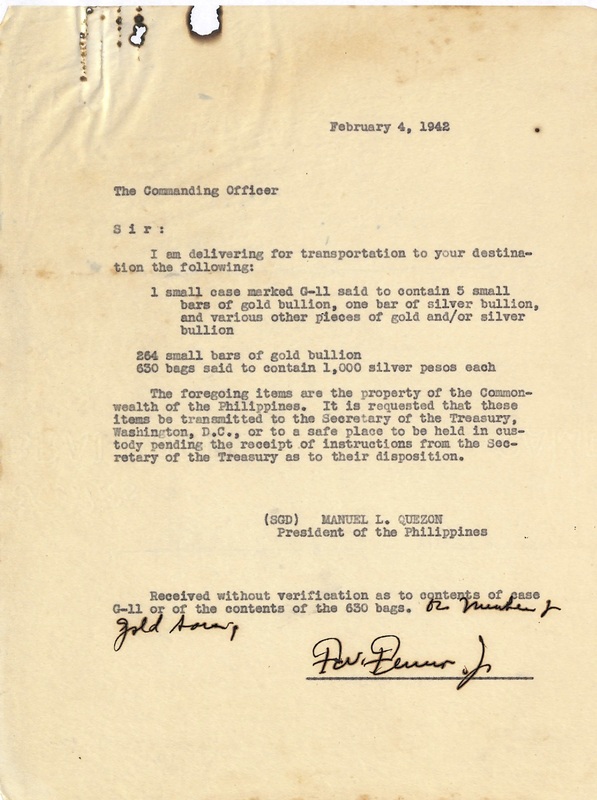 February 17, 1942: Letter of appreciation on cooperation in conducting inventory of Treasury Vault. 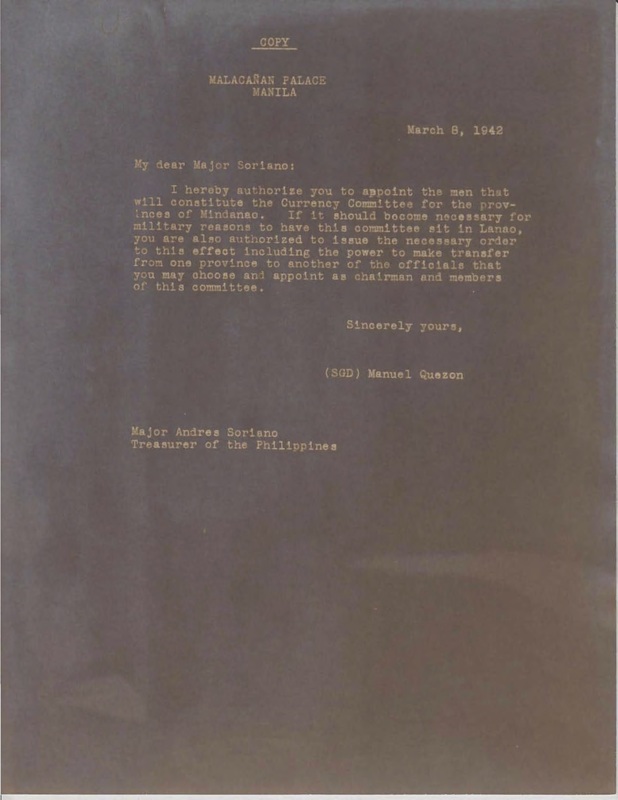 February 19, 1942: Soriano appointed, ad interim, Treasurer of the Philippines. March 8, 1942: Authority to constitute the Currency Committee for the provinces of Mindanao. 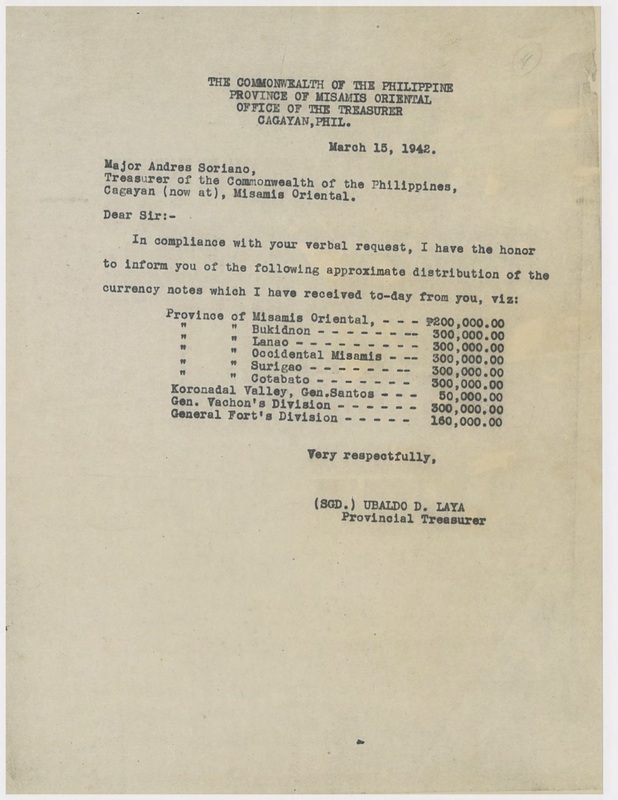 Cebu City, March 10, 1942: Treasurer’s Receipt. Part 1, part 2. March 15, 1942: A treasurer’s report. 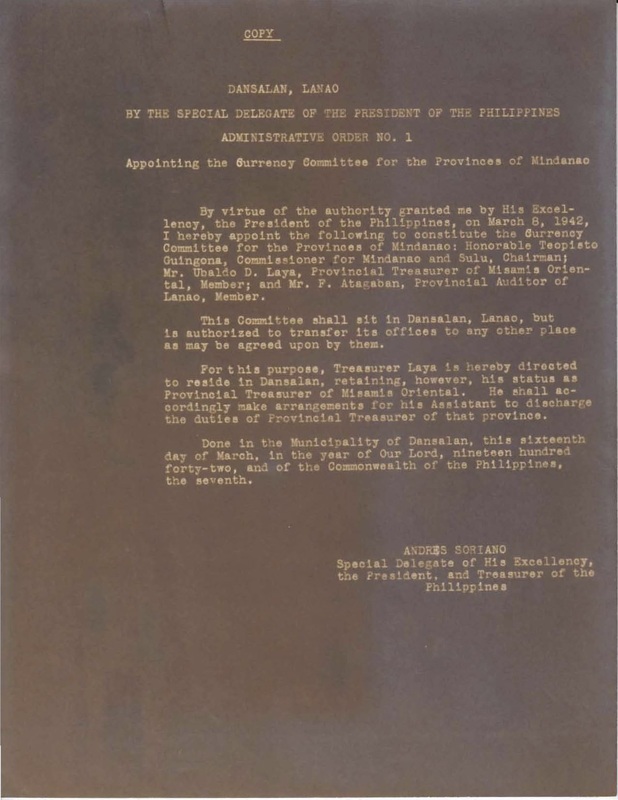 March 16, 1942: Appointing the Currency Committee for the Provinces of Mindanao. 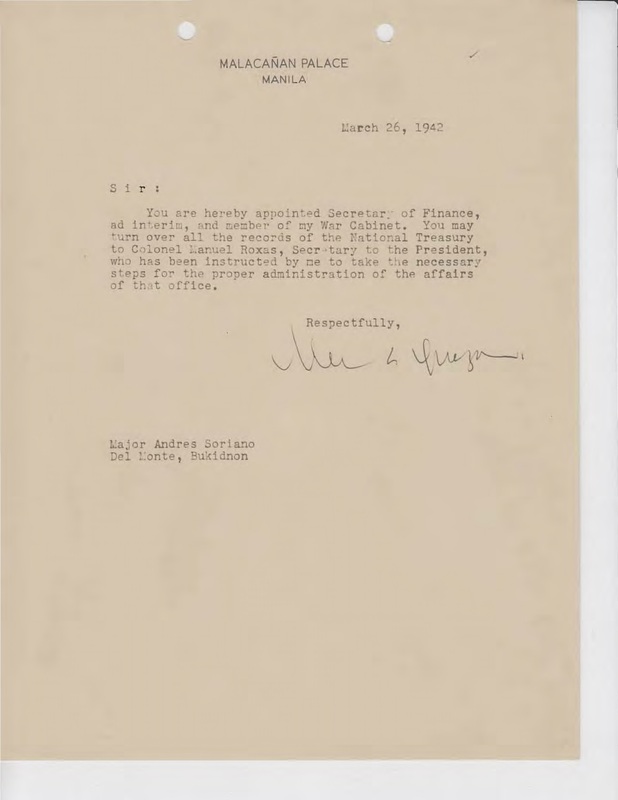 March 24, 1942: Counterpart No. 1, Counterpart No. 2a and No. 2b, Counterpart No. 3, Counterpart No. 4, Del Monte, Bukidnon. 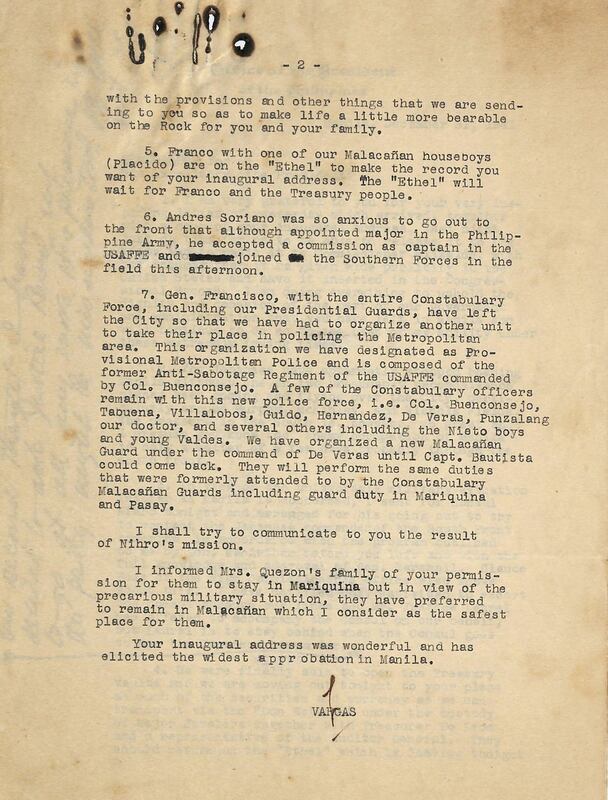 March 24, 1942: In the event the military situation indicates that the Commonwealth Government funds are in danger of being captured by the enemy, the Commanding General. Mindanao Force, may order destruction, by a Committee of Three who will certify that the funds have been destroyed by them personally. 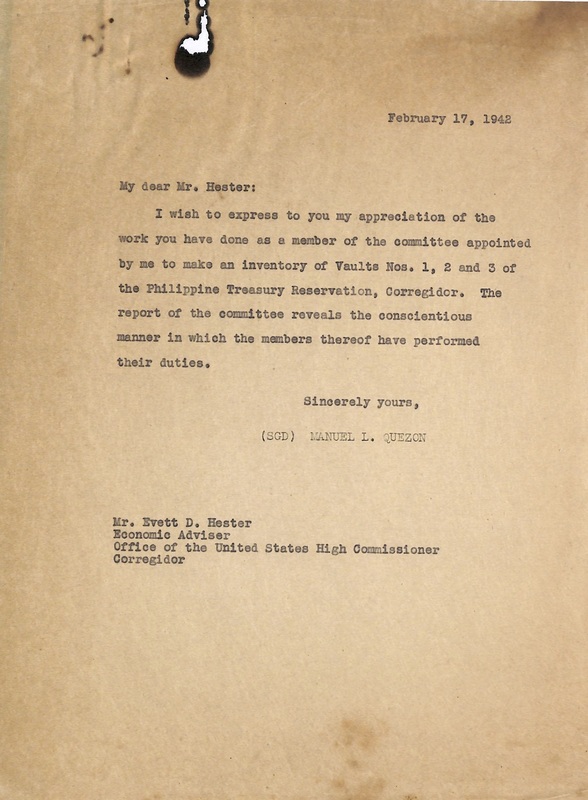 March 26, 1942: Counterpart No. 5 and 5b, Counterpart No 6, Counterpart No. 7, Counterpart No. 8, Del Monte, Bukidnon. Andres Soriano appointed Secretary of Finance ad interim. 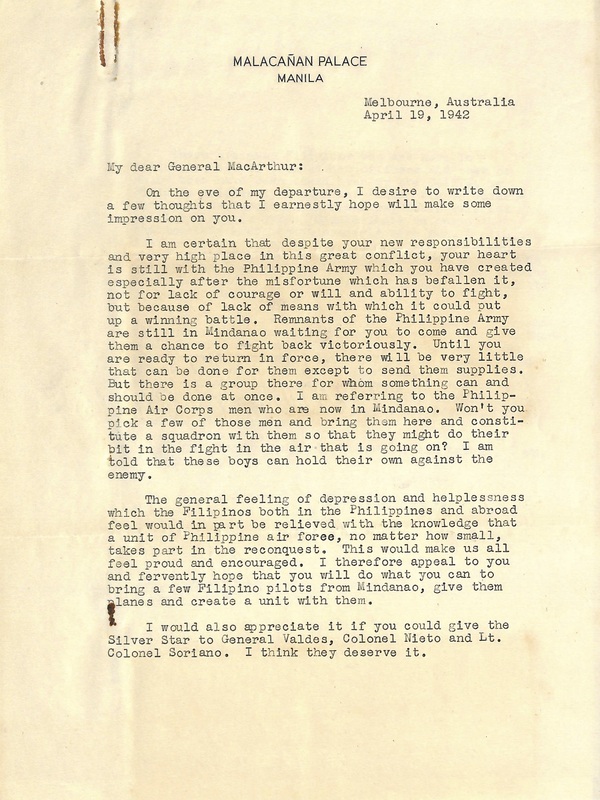 April 19, 1942: Letter to MacArthur authorizing Joseph McMicking to disburse Commonwealth government funds for contingencies. Part 1, part 2. 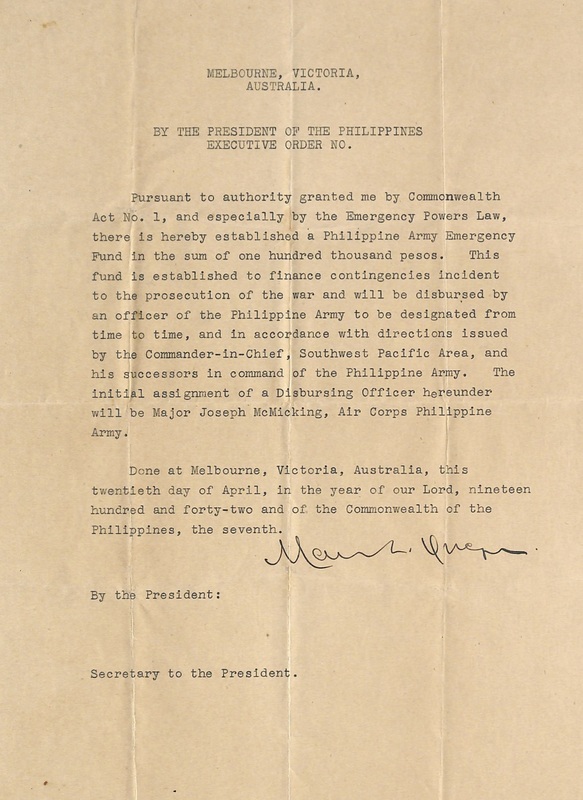 April 20, 1942: Unnumbered Executive Order establishing contingency fund in Australia. 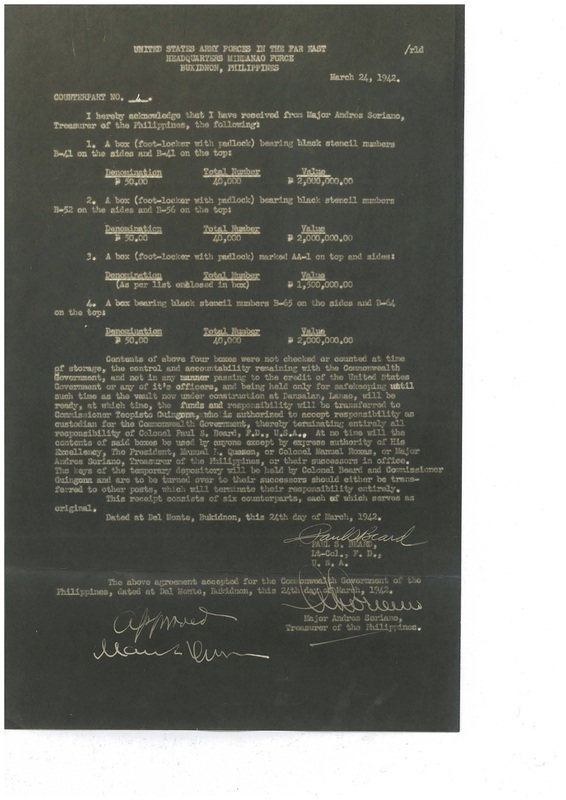 May 21, 1942: Submission of documents to the Auditor General in Washington. Part 1, part 2. November 20, 1942: Excerpt from minutes of Cabinet Meeting at the Shoreham. January 8, 1942: Excerpt from minutes of Cabinet Meeting at the Shoreham. 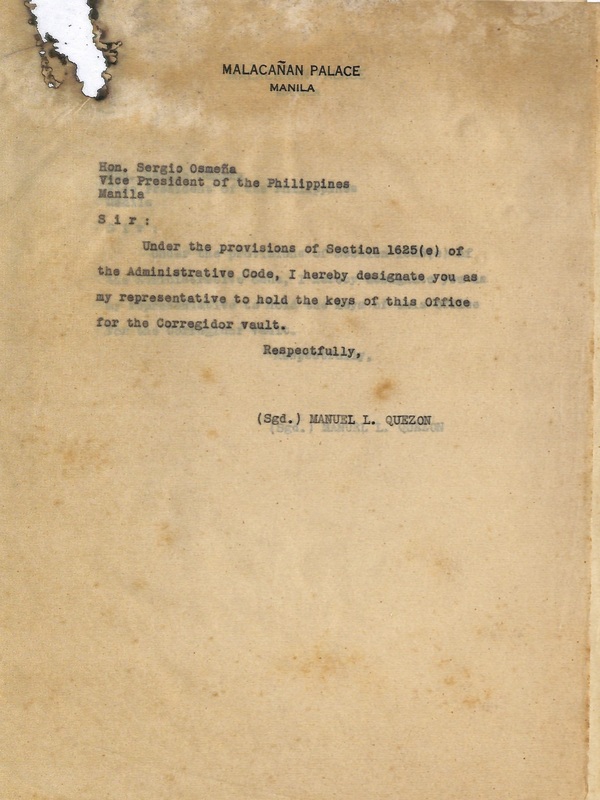 January, 1946: Ten months of President Osmeña’s Administration.